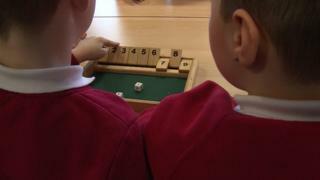 Schoolchildren in the valleys have the lowest reading and numeracy levels in Wales, the BBC has found. Pupils from schools in Blaenau Gwent, Caerphilly, Merthyr Tydfil, Rhondda Cynon Taf and Torfaen scored the lowest results in last year's English language reading and numeracy tests. It is the second year children aged between seven and 14 have been tested. Education experts said the skills gap between the most and least deprived areas is failing to get narrower. According to the 2010 National Survey of Adult Skills in Wales, more than 900,000 people in Wales - around half the adult population - have maths skills equivalent to primary school pupils aged between nine and 11. Education advisor and consultant Prof David Egan said: "There is a huge gap between those parts of Wales where deprivation is at a high level and those parts of Wales where that's not the case. "It's a particular concern in some areas of Wales - not just the valleys. But certainly it is a concern in the valleys." According to latest figures, more than 15% of adults in Blaenau Gwent left school without any qualifications, almost twice the British average. Nick Bush, of Tir-phil near New Tredegar, is taking adult education courses to try and make up for his lack of basic skills. The 23-year-old says he struggled with maths throughout his time at school. Mr Bush said he has to rely on other people to help him with simple tasks like budgeting or catching a train. He said: "I'm asking people, 'when's the next train due mate?' I tried reading the timetables as well and it's just all confusing. "It is honestly horrible knowing that I can't do it myself. And they just look at me strange, saying, 'what's going on with him then?'" Week In Week Out programme: Can't read, can't do my sums, BBC One Wales, Tuesday 22:40 GMT.